record snowfall and global warming | brainsnorts inc. In the Northeast, we’ve been hit with record snow this winter. Of all the problems that the snow has brought, there are two I care about most. First, how to make up all of the lost school days. My current schedule shows I’ll be in school until at least June 28. With today gone and tomorrow in jeopardy, June 30 would not be a surprise. The second problem, and more important problem, is how this winter is being misinterpretted by those who claim that global warming and climate change is a hoax. Too many loudmouths, the usual suspects reading Republican scripts, have said that you can’t have record snow if we have global warming. They distort the arguement by pretending to not know or ignoring the fact that the word “climate” means long-range weather and not individual days or weeks, such as would produce record snowfall. If you understand what an average is, then you can understand that you will have highs, mediums, and lows at any given time, but you must follow trends and calculate averages to tell the whole story. They know what the story is, but they want neither to read it nor for you to read it. Of course there will be sub-freezing days during a climate crisis as that’s a normal abnormality. However, focusing on one day is like reading one page of a book and believing you know the whole story. What they also don’t realize is that this record snowfall is actually evidence that proves climate change rather than discrediting it. Climate change is not just temperature. It’s also about the redistribution of moisture. Behind my house is a farm owned and operated by a local family since forever. I was at my back fence one day as the farmer was walking along the edge of his cornfield. (Yes, I have thought about jumping the fence for corn, tomatoes, peppers, watermelons, etc) After he laughed at me because of how much time and effort I put into growing something as easy as grass, I asked his opinion on global warming and climate change. He stopped, looked around, and pointed at the field. Climate change, as I said, is also about the redistrubution of moisture. 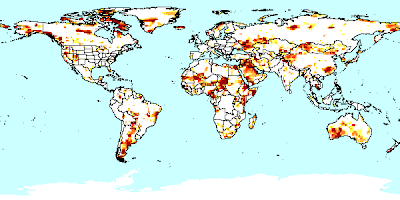 The map at the top of this entry shows areas around the world that are currently suffering severe drought. Water is finite. There’s a limited, fixed amount on the planet at all times in various forms, such as snow, ice, rain, etc. If there are areas in the world suffering extreme drought, then there must also be areas who now have the moisture that has left the drought areas. Have you noticed the flooding in the news? Have you seen the unprecedented days of rain in the Los Angeles area? What about the mudslides that wash houses away? When I drive to work, most houses have ponds in their front yards from the amazing rain and snow we’ve gotten. Back in 2001, this same area was in the midst of a record drought, and now it’s flooded. Up until last year, my town has had three years of water restrictions, and now it’s flipped to flooding. This is all part of climate change and global warming. Just like the evolution/creationism debate, nobody can 100% prove or disprove either side of global warming and climate change, but there’s a big difference in the approach. With evolution/creationism, it’s all in the past. It happened already, and there’s nothing that anybody can do to change it. Regardless of how humans got here, we’re here. However, climate change can still be acted upon if it does in fact exist. That leaves two options. Take steps to solve a problem and improve a crisis that’s not really there. It’s like insurance. If we take the steps necessary to stop or slow global warming, there is no question that the planet and its people will be healthier and safer. The other option is to do nothing when something very much needs to be done. We can continue on the path that has caused and will escalate great environmental destruction, including the human consequences, and do nothing about it. I would rather take steps that are not needed than to do nothing when I had the chance to help. Would you rather take medicine when you didn’t need it, or would you rather not take it when you should have? Just give me a glass of water – half full – to save some for the next guy. February 25, 2010 in climate change, drought, flood, global warming.